President Salva Kiir, leader of the world’s newest state of South Sudan, addressed the United Nations General Assembly last week and met on the sidelines of the forum with other world leaders, including President Obama. Just six years ago, South Sudan was embroiled in a civil war, one of the longest and deadliest of the 20th century. How much credit for that transition is due to the United Nations? Keynote: Dr. Esther Brimmer, Assistant Secretary of State for International Organizations, who serves as one of the main representatives of U.S. interests at the U.N. Ambassador Nancy Soderberg, former ambassador to the U.N. for Special Political Affairs with over 20 years of experience in high-level foreign policy roles in the U.S. Senate, White House, and United Nations. Ambassador Richard S. Williamson, former Assistant Secretary for International Organizations and seasoned representative of the U.S. to the U.N. through Ronald Reagan, G.H.W. Bush, and G. W. Bush administrations. When asked to cite some of the U.N.’s successes, all three panelists spotlighted the use of peacekeeping missions worldwide and U.N. engagement in Sudan, where the United States has long had a strategic and humanitarian interest. Sudan not only has the world’s second largest deployed force worldwide; it also has separate missions in Darfur and a new force in the contested area of Abyei. The panelists cited the U.N.’s pivotal role in the fairly orderly South Sudanese referendum. As an entity of concerned member states, the U.N. applied pressure on President Bashir for the referendum to proceed peacefully and rallied support for the transition. Williamson specifically commended U.S. facilitation of the Comprehensive Peace Agreement in 2005 that ended the civil war and paved the way for the deployment of the U.N. mission. But Williamson for one was quick to add the caveat that missions have faced some significant shortcomings, specifically mentioning the civilian protection failures of U.N. troops when government troops and militias invaded Abyei in 2008. 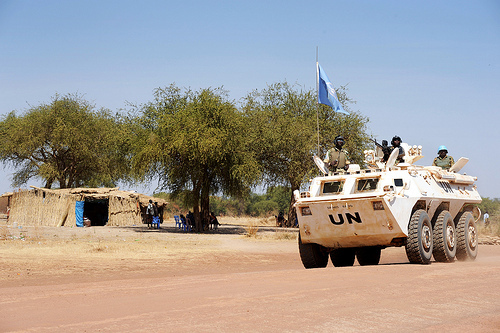 A similar invasion took place in Abyei in May, and the ongoing attacks against civilian populations in the border states of South Kordofan and Blue Nile have followed the same pattern. In these recent instances, international condemnation and investigation by the United Nations has so far been underwhelming and has even tapered off. For the U.N. successes in Sudan to not be overshadowed by the recent attacks and widespread civilian displacement, there must be urgent multilateral commitment to address the human suffering. A timely discussion, this forum followed shortly after the most recent iteration of criticism of U.S. relation with the U.N., over questions about whether the United States is financially over-engaged in the United Nations, a body whose goals, some critics allege, are misaligned with U.S. core interests. Brimmer debunked the premise that direct U.S. interests are not served by multilateralism through the U.N. On the contrary, such engagement provides tangible benefits to the United States and “lets us share with other countries the financial and political burden of addressing global changes,” she said. To be frank, the important issues to be addressed, that are being addressed, in the U.N. will be taken up whether we’re there or not. So in reality, the choice is, do we want to be part of that conversation? Do we want to maintain global leadership and be involved in helping shape those ideas or do we want to cede that role to others who may have very different objectives? A recent report, “Withdrawing from the United Nations: A Misguided Assault,” by Sarah Margon and former Enough Executive Director John Norris of the Center for American Progress formed the basis for the event, which can be watched in full on video.